Getting a big family ready for any kind of outing takes extra…extra time, extra effort, extra energy. When you throw a baby into the mix, you have to plan even more carefully. 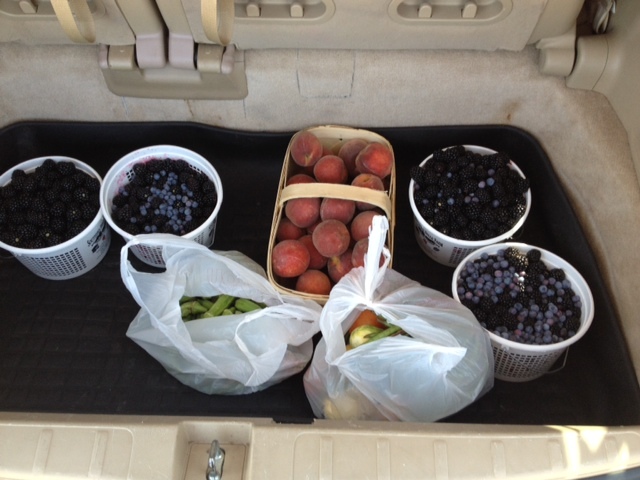 That’s why I was super excited that we actually had everyone out the door and in the van by 8:00 am on a Saturday morning, heading an hour south to a town called McDonough, Georgia to go berry picking. 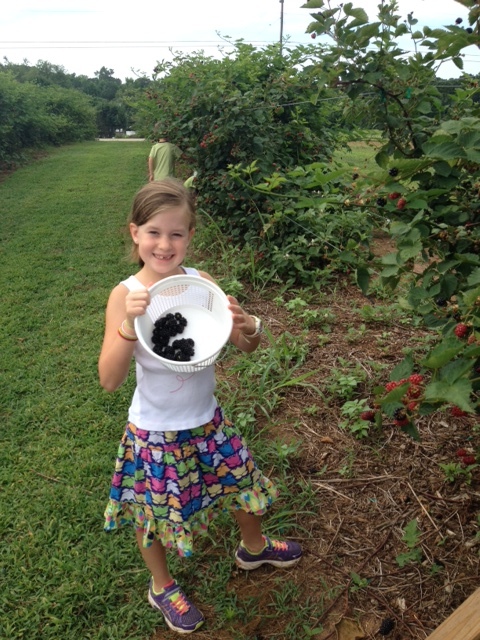 It takes so much extra that I almost cancelled the outing, but my desire for fresh blackberries overcame my non-desire to do the extra work to get us there! When we arrived, the weather was surprisingly cool for late June and the children were ecstatic. 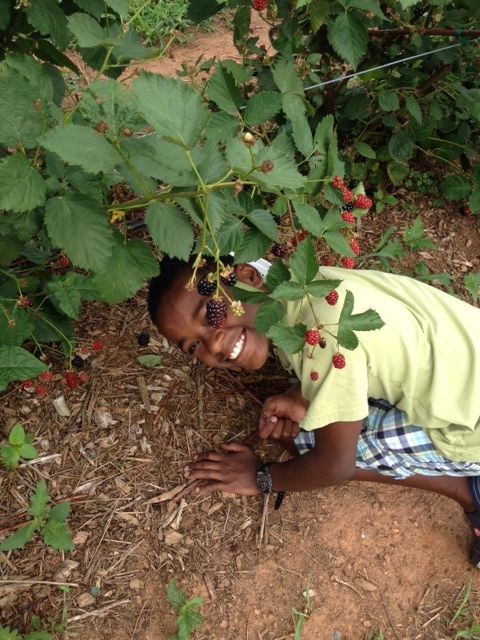 After visiting the variety of animals, we finally made it to the blackberry bushes…and oh, the blackberries! 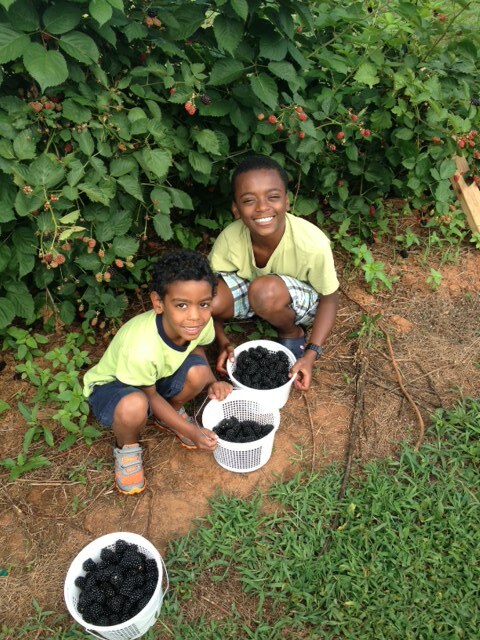 There were thousands ready to be picked…big, plump and full of summer sweetness. Our kids have never done anything like this, so their shock and awe was pretty priceless. 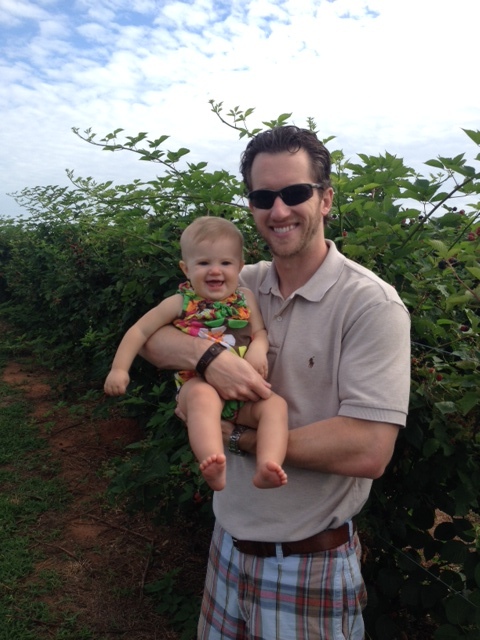 Molly Kate (my biggest lover of fruit) was delighted, saying she could easily see us living on a farm and that picking berries was so much better than most fun, she couldn’t even think of a word to describe it! 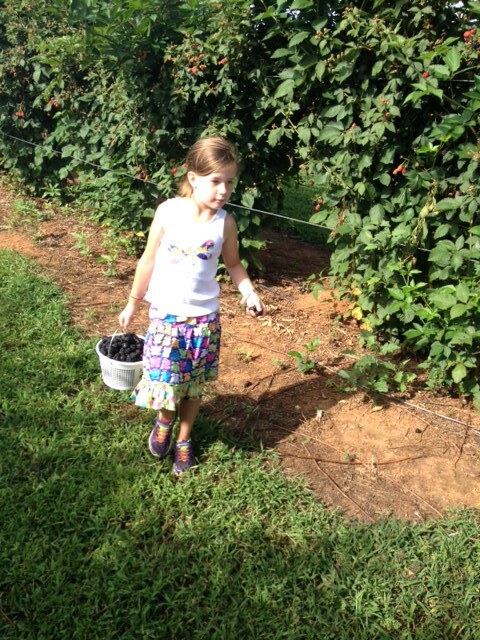 She even said she was falling in love with the blackberries…it was pretty darn adorable! Slowly, the summer sun began to warm up the day, so after tackling some blueberries and noticing that Maggie was rubbing her eyes and past ready for her morning nap, we decided to call it a day. We headed to the little hut to pay for our fruit when I overheard the cashier telling another customer about the okra ready to be cut. Okra?!?! 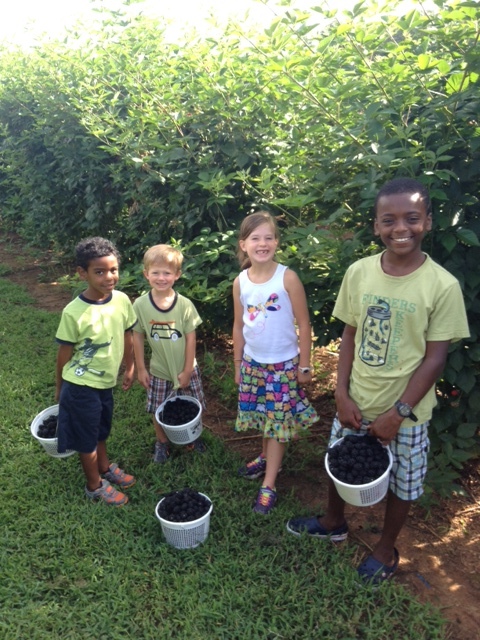 If there’s one thing to be true about the Cuthbertson clan, it’s this…we probably love fried okra even more than blackberries, especially when it’s fresh from the garden! The big kids were waiting to see if I would head back out to the field and Kevin sweetly offered to take the two littles back to the van and out of the heat. 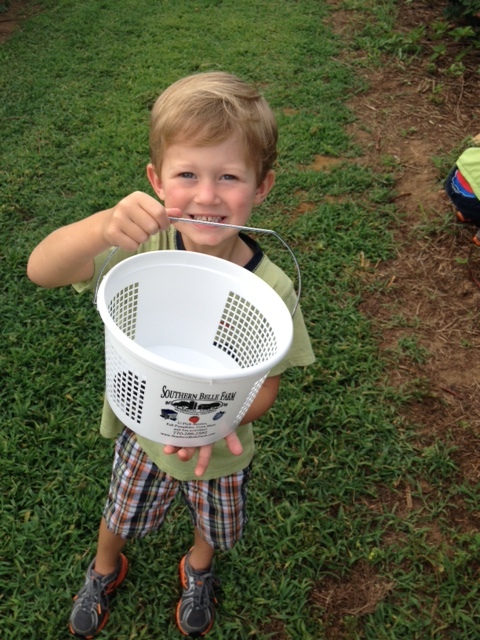 Yep, back to the field we went with shears in hand to fill a 2 gallon bucket with whatever goodness we might find! We conquered the okra…I say conquered because you had to practically dive into the huge plant to find the ones ready to be cut and there were bees swarming in and out the entire time. Plus, without any gloves, I was being eaten alive by the scratchy leaves. But to our delight, we also found squash, cucumbers, tomatoes and string beans. 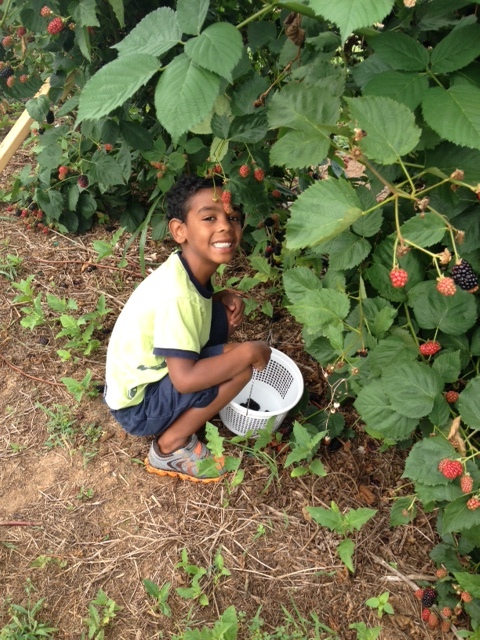 I could already taste dinner and a blackberry cobbler! And as much as I have meditated on those words and found counsel and comfort in times of trials, I deeply struggle to believe them when dealing with my own sin. I can say with all my heart that I believe that God has favor on me because He chose me and I have trusted in Jesus Christ and Him alone. I know that my works could never earn God’s favor and I know any good in me is because of His grace at work in me. But, when I fail…I mean when I really blow it, I act as though none of this is true and I picture my Father looking down on me in disappointment and disdain. My reaction in these times proves that I still seek to perform for God, I still believe I can please Him with all my good works and I still fail to rest in grace. It was a long, hard evening…my heart was low and the truth blaring at me was more than hard to swallow. But isn’t God good that He doesn’t let us continue on in unbelief….He opens our eyes and unveils our hearts and points us back to the pure joy and hope found in the gospel alone. He relentlessly pursues our holiness and sanctification through all sorts of ordinary means, sometimes even burnt okra. Love hearing your heart. Thanks for sharing!